The 35-year-old former NBA star has woken up from a coma he slipped into after being hospitalized on Tuesday, following a drug overdose at a brothel in Nevada, and is able to communicate. On Friday, Odom opened his eyes, saw Khloé Kardashian, who has been by his bedside as he fights for his life, said, "Hey, baby," gave her a thumbs up and then went back to sleep, a source told E! News. The source also said he is no longer using a breathing tube. Another source told E! News on Friday afternoon Odom is speaking and functioning. In addition to Khloé, 31, he is with his children and other family members, including cousins. Khloé, who arrived with mom Kris Jenner and several of her sisters, had had Odom's father, his two kids and their mother flown in to see him. However, despite his "miraculous recovery," he is not out of the woods, E! News has learned. The basketball player was found unconscious at the brothel. At the hospital, he was hooked up to a ventilator and his condition was deemed critical. Doctors had indicated to his family that because he likely suffered multiple strokes, he could have severe physical and mental impairment and that the longer he remained unresponsive, the less likely he may have normal brain function if and when he woke up. 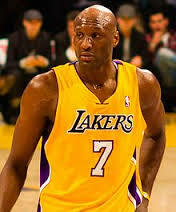 Odom's friends and fellow basketball players, including Kobe Bryant, who was his teammate when he played for the Los Angeles Lakers, have also visited Odom at the hospital, while others have expressed their support from L.A.
"Hopefully he gets well, hopefully he pulls out of this thing, and get the support that he really needs," an emotional Metta World Peace told E! News on Thursday. "And that's pretty much all I really have to say."